Kathmandu had been on my 'list' for a long time. There are places that just intrigue me when I just hear their names: Timbuktu, Zanzibar, and Kathmandu. Is that enough reason to go to such places? Kathmandu did not live up to the image I had in my head. I'm not sure I can even describe that image. Exotic. Mystical. Transcendent. I suspect the image I had was a Kathmandu of the past. A Kathmandu of the '60s and '70s. 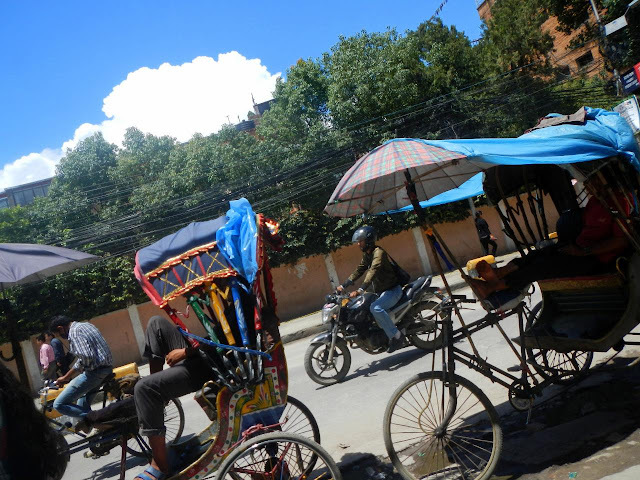 Kathmandu of the '10s is a crowded, noisy, dirty, trashy place. I wanted the Kathmandu when all the places we visited really did require a drive through the Nepalese countryside. That Kathmandu doesn't exist anymore. While I was in Nepal I let my disillusionment cloud my vision. When I got home and looked through the pictures I'd taken I was surprised at all the cool things I'd seen. Where was I when I was taking these pictures? Yeah, Kathmandu was not what I'd been expecting but it was still pretty cool. I'd just let my disappointment get in the way. In retrospect we didn't do Kathmandu, and Nepal in general, the right way. We had three half and one whole day of free time that we should have filled. I didn't do my research. I left it all to our tour guide. There was no reason why we couldn't have asked our guides to take us to more places. I'm sure there was more we could have seen. I just didn't do my homework. The sad part is I think our tour guide knew we could be doing more. We kept getting calls from the tour company asking if we were happy. This was irritating in the moment but I realize now that we were always giving them the wrong answer. We kept saying yes when we should have been asking what else there was to see and do. At a minimum some kind of substantial trek on our last day would have been an improvement I think. So instead of having this awesome memory of Kathmandu, we have a feeling of disappointment that can be summed up by what the Wife said upon getting home: On the radio she'd heard Bob Seger's "Kathmandu" and said something like "That song doesn't make sense anymore." Yeah ... It doesn't make sense anymore. Pictures from the Nepal portion of our travels can be found in my 2012-07 Nepal Google Photos album. A Moment Of Shear Panic! This weekend I was thinking about all the data I had stored on my Network Attached Storage (NAS). An NAS is a hard drive that connects to your network and allows you to share data with all your computers. I had a lot of data my NAS - 200 GB of pictures alone not to mention music, podcasts, copies of bills and official paperwork. My NAS was set up in a RAID 5 configuration which means if one of the four hard drives were to fail, you could recover all of the data. On Saturday, being a bit paranoid, I started looking into online backup services. Forty-five minutes later my NAS died. After a moment of panic and a call to tech support, the first diagnosis was a failed hard drive. I ordered a new drive and installed it this afternoon. All I had to do was power up the NAS, browse to its setup page, and tell it to rebuild the RAID 5 array. Easy-peasy. It would have been very easy if the NAS would have responded to my commands. The thing was being stubborn. I contacted tech support and talked to a nice guy who, for about an hour, walked me through several different procedures attempting to get get the infernal box to communicate. In the end we determined that the failed hard drive might have only been a symptom of a bad NAS controller (The mini-computer that controls the NAS functions). "What's my next step?" I asked. Well ... it's not in warranty ... and that model had been discontinued ... that means we can't do anything about it. He then referred me to a data recovery company that cuts deals for people in my situation. I called the data recovery company and talked to some really nice people. No problem. "How much would it cost?" I asked. I thought it would be less than $500.00. A pause. The minimum ... $800.00. The maximum ... $3,900.00. His best guess ... around two grand. Are-You-Kidding-Me??? He wasn't. I called another service near Omaha. They quoted $3,000.00 - $9,000. Holy S*&^%^$!!! I packaged the drives up and will be shipping them to the first place tomorrow. They are paying the shipping and the evaluation will be free. If I don't like the final quote they'll even send the drives back for free. We are chalking this up to a lesson learned. I thought I had been more than careful. If it had lasted a few more weeks I probably would have had everything backed up in the cloud. Obviously I was not careful enough. When I get the drives back I will back everything up to an online service. I may even keep a couple more copies of the data at home just to be sure. Lesson learned ... damn it ... Lesson learned. When we landed in Nepal a couple days earlier our guide suggested an add on to our trip. He suggested hiring a plane to fly us around Mount Everest assuming the weather would cooperate. 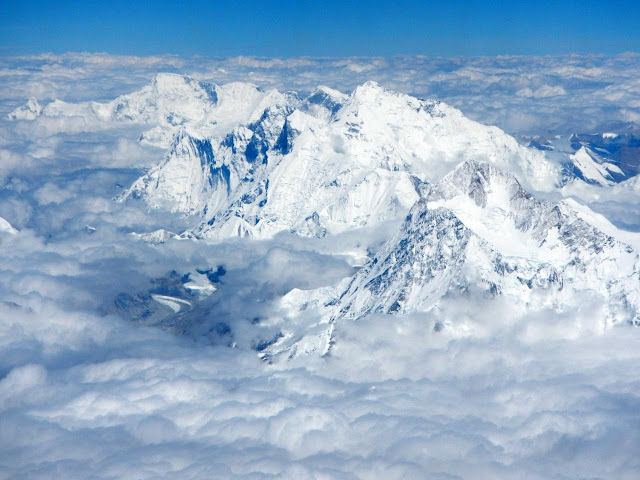 I've flown in similar sightseeing trips around mount McKinley and the Hawaiian Big Island and had found the experience only mildly satisfying. We thought about it and we decided to opt out of the plane ride. I think we made the right decision since we would end up seeing Everest three times out of the window of our commercial flights. After turning down the Everest option, we started our day at Bodhnath, the largest stupa in Nepal and venerated by both the Nepalese and Tibetan Buddhists. The stupa is by far the largest we've seen on our travels. We circumambulated the stupa along with the other visitors and monks. We stopped at shops in the square surrounding the stupa. We bought a thangka (an intricately painted wall hanging - we'd seen them being painted in Lhasa) and the Wife found some scarves to buy. Bodhnath Stupa in Kathmandu, Nepal. Next was the Pashupatinath Temple on the Bagmati river. The temple, the holiest temple dedicated to lord Shiva is interesting but non-Hindu are not allowed to go inside so it was a little of a let down ... but I understand that not everyone enjoys tourists visiting their places of worship. There were times when the closest a non-Hindu could come to the temple was on the other side of the river. The rules are more relaxed now but there are still places only the devout can enter. 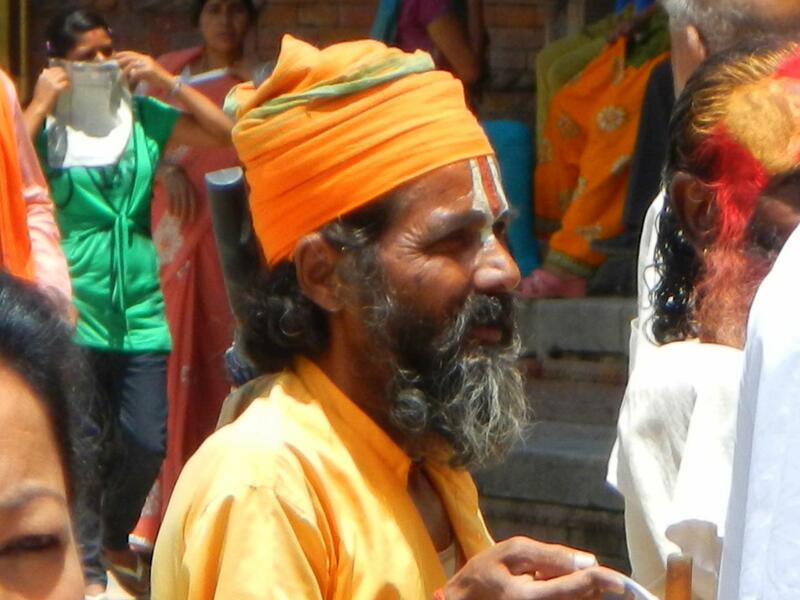 A worshiper at the Pashupatinath Temple. We walked around the temple area and ended on a bridge over the Bagmati river. Along the shore of the river were crematory platforms. After bodies were burned their ashes were poured into the river. To the Wife's and my dismay there was a body being cremated as we watched. The idea of breathing in some dead person was a little unsettling. 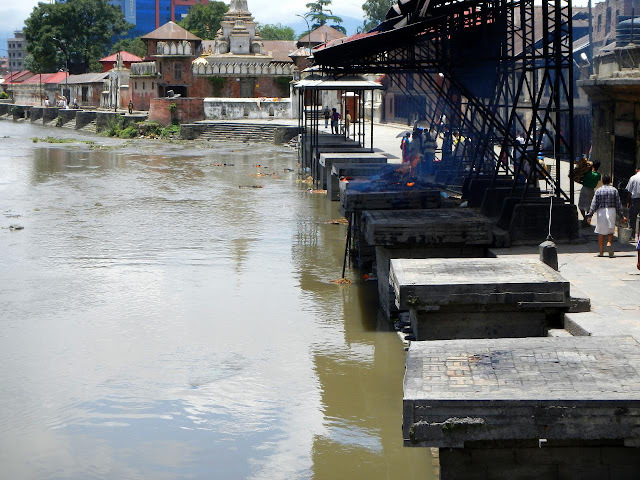 Cremation platforms along the Bagmati River. Back in the car and we actually left the city and went to the town of Bhadgaon (or Bhaktapur). We actually saw some countryside this time. It was only about fifteen minutes worth but it was something. 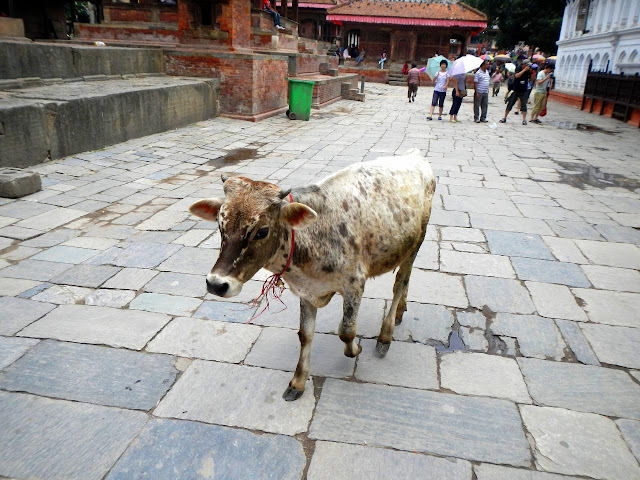 In Bhaktapur we saw more history and temples. 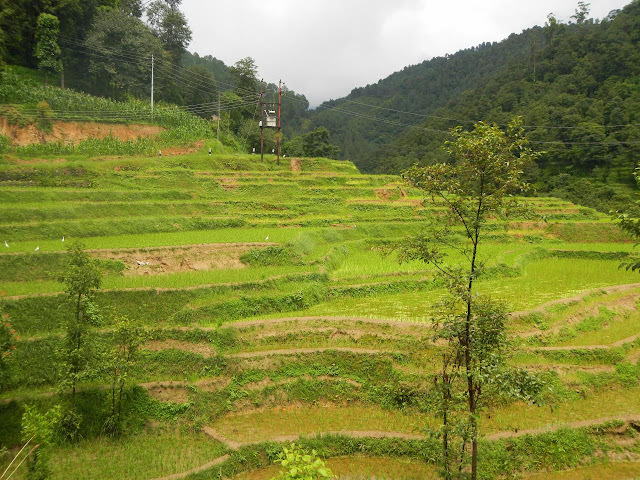 I have to admit, while the temples were gorgeous and interesting, the few minutes where we could see rice paddies and people working in the field were more interesting to me this day. We were done in the early afternoon and once again we had it all to ourselves. After having lunch at our favorite cafe/restaurant we split up, the Wife going back to the hotel while I walked a few blocks to take pictures of a small temple. The temple is only open once a year so I could not go in but it was in an interesting setting surrounded by water. 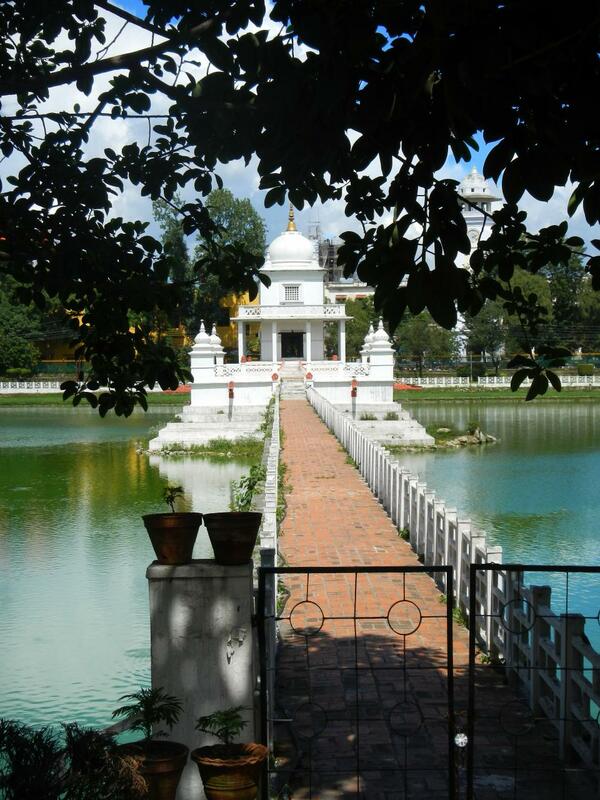 Rani Pokhari, open only once a year. On the way back I took pictures of graffiti and slogans painted on walls. As I walked everyone asked where I was from. This had happened several times over the last few days and, frankly, I was getting tired of it. A guy asked me while I was walking and I answered a bit curtly. Before I know it he was handing me over to a guy selling tours. I turned them down telling them I was already on a tour and walked away. I hate the hard sale and Kathmandu had a lot of that. On the way back to the hotel I stopped at an ice cream store and had some tasty ice cream. That fixed everything. Day Twenty - Happy Anniversary! Our final full day in Nepal, which was on our fifteenth wedding anniversary, was a free day - a result of all the trip rearranging that we had to do before the trip. The day before we discussed our options with our guide and we settled on a drive up into the foothills of the Himalayan mountain to get a good view of the Kathmandu valley and the surrounding mountains. They picked us up and we truly left the city this time driving passed rural areas on the way to a vacation area popular with the Kathmandu people. Now, while I was hoping for sweeping vistas, I knew that driving up here during the monsoon season wasn't conducive to vistas in general. We'd had better than expected weather in China and in Nepal the weather was even better with only a few light showers in the afternoon and evening. I really hoped we would be lucky today. We did not run into rain but we did have to contend with the ever present overcast. Oh yeah, and we were driving up in the mountains ... into the overcast. By the time we reached our final destination we had only limited visibility. We got out of the car and walked up a short trail to the top of a hill to see clouds and haze ... and kids asking us where we were from ... sigh. We returned to the car and we drove down a bit. The guide asked if we wanted to walk and we said yes. Our car dropped us at dirt farm road and we headed down the road walking through farmsteads with some views of clouded valleys and terraced farm fields. It was a nice walk, maybe two kilometers (1.25 miles). The car was waiting for us at the other end of the road/trail and we returned to the hotel. Early on our guide had asked about trekking. I'd been concerned about the altitude and the weather. I told the Wife I wasn't interested and she went with that. After our little mini-trek I regret my decision. By that third day in Kathmandu we were both acclimatized and a more 'authentic' day trek in the Himalayas would have been not only doable but I think I would have enjoyed it. Not sure if the Wife would have enjoyed it though - more about this when I post about the Tiger's Nest. Our drive and mini-trek might have been the appropriate compromise. Pictures from days nineteen and twenty (07/10 - 07/11/2012) can be found in my 2012-07 Nepal Google Photos album. Book: Ed Stafford's "Walking The Amazon: 860 Days. One Step At A Time"
I'm less than a year away from my second Camino and the hiking bug is whispering in my ear. That's probably why my next two books have been about hiking. The first, the one this post is about, was Ed Stafford's "Walking the Amazon: 860 Days. One Step at a Time. " Now, before I go any further, I have no intention what so ever to hike the Amazon. Taking a cruise down the Amazon river is on my list of things I want to do but hiking it ... not so much. The Wife has nothing to worry about. The book is the self narrated story of Stafford's successful attempt to walk the entire length of the Amazon river, something that had never been done before. He starts in Peru on the Pacific ocean beach, hikes over the Andes to the farthest documented source of the Amazon and then continues along it's entire length. Along the way he hires guides and companions including Cho who accompanies him for most of the journey from Peru to the Atlantic ocean. Also along the way he encounters hostile natives (who believe white people eat babies), drug runners, insects, snakes, and shortages of food and money. What started out as a year to hike the river turned into two and a third years. Stafford does a good job describing how he was feeling and how his mood would swing from day to day. His narrative, along with excerpts from the journal he kept, give you a good picture of just how difficult this endeavor was. One thing I never considered was how the Amazon floods during the rainy season. The jungle on either side of the river for miles, tens of miles, turns into swamp. Stafford and his guides would hike up to their chin in water at times while hacking through the tangled jungle with machetes. One day, after almost six hours of hiking, they had moved 400 meters (0.25 miles). That would have demoralized me to no end. Stafford's writing style reminded me of my style, very conversational and informal which made it an easy read. It could have been polished a bit more but if it had it probably would have lost something. There is a blog that has more information about the trek and it can be found here. I like this book. Definitely recommended. I haven't been writing much this week. Last Sunday the Father-in-Law (FiL) had an episode - not sure what to call it ... maybe a seizure - that left him unconscious on the living room floor. He was taken to the hospital by ambulance. They found he had an enlarged heart and that the different parts of his heart weren't cooperating. He was air lifted to a hospital in Des Moines where he got a pacemaker/defibrillator installed. He returned home on Thursday. The FiL is doing well. His new part is doing its job. The hardest part of all this will be the change in habits and diet that will follow. No driving for six months will be the most difficult but I know he will figure out a way to cope. All this drama really messed up this week for the Wife and I but being with the FiL and MiL while this was all happening was important to us. A special thanks to the Wife's Brother and his wife - they were really there for the FiL and MiL. We both ended the week exhausted, both physically and mentally - can't imagine how the MiL felt. I managed to publish a rather mediocre Nepal post this week but nothing much else. Now that the FiL is back home and feeling better, things will start to return to normal. We left Chengdu, China and flight number nine took us to Nepal. On the way we saw Mount Everest sticking up from the clouds (The first of three times we would see the highest point on Earth). Later the Wife would say she wondered why we were flying so low before realizing the mountain was just very high. Heh. Mount Everest from the airplane. We arrived in Kathmandu and worked our way through customs. We stood in line to find that we needed to fill out a form. The bored customs agent point us across the room to a table with forms stacked on them. We went over and filled out our visa applications and got back in line. The bored looking agent asked us where our pictures were, rolled his eyes, and pointed at a small booth not far from the table with all the forms. For a small fee we get our pictures taken and ... got back in line. This time everything met the bored agent's requirements and our passports were stamped. We actually made it out of the airport in short order despite our having to get in line three times. We exited the airport and found our guide. The guide introduced himself (Dinesh) and we got in a car and headed out into the traffic nightmare that is Kathmandu. What a shock to the senses. China was crowded but it was also clean and rather orderly. Kathmandu was chaos. Nepal had changed governments recently. After years of civil war between the monarchists and the Maoist factions, peace was brought to Nepal after both parties agreed to democratic elections. The Maoist faction won the majority. Unfortunately the four or five years since the elections the Maoist haven't figured out how to run their country. The city was noisy, crowded (8.8 million people - nearly a quarter of the countries population), dirty (piles of garbage everywhere), and not what I'd expected. The number of motorcycles out numbered the cars nearly two to one and the number of horns out numbered the vehicles three to one I'd guess. The Nepalese drivers sure like the sound of their horns. Our guide dropped us off at the hotel after pointing out a few interesting places nearby and places to eat. It was noon and we had the rest of the day to ourselves. The hotel was older but nice enough. We left the hotel and walked to a nearby neighborhood popular with expats. The area was filled with restaurants and stores. Most of the stores were trekking and camping supply stores. You could tell what the main tourist activity of Nepal was. We ended up at a small cafe/restaurant a short walk from our hotel where we had something to drink and a small snack. We returned to the hotel and we both crashed hard. I was feeling a little unwell, looking back, it was probably a mix of altitude and lack of a decent meal. After a nap we went swimming in the hotel pool. That evening we went back to the cafe/restaurant and had a spaghetti dinner and plenty of water. This made me feel much better. From this point on we would end up eating a lot of western meals by choice. Most of these for me would be some sort of pasta. After breakfast at the hotel restaurant we met our new guide. Dinesh turned out to be the boss of the local travel agency (Yeti Travels) and our daily guide would be an older gentleman with bad teeth. We were introduced but neither the Wife nor I caught his name. By the time we realized that neither of us knew his name it was too late to ask him without embarrassing ourselves. Between us we called him Mr. Jones. Mr. Jones was very intelligent. He read a lot and was the largest donor of books to the Kathmandu library. As we drove through the noisy streets of Kathmandu he pointed out trees and birds - both common and Latin names - which made me think about the teachers from San Diego. They would have loved this. Swayambhunath stupa - The Monkey Temple. 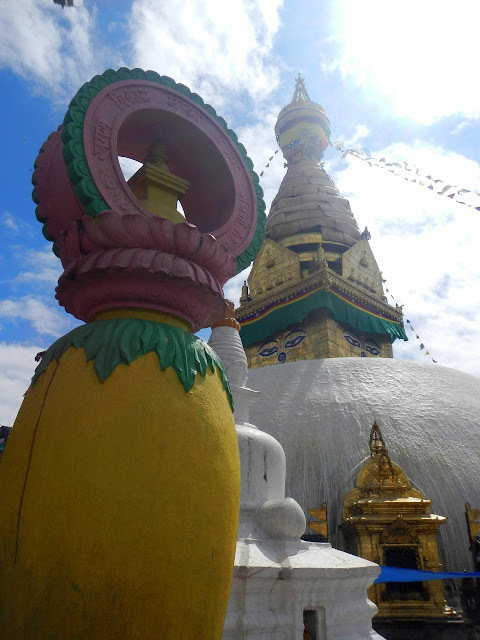 Our first stop, not on our original itinerary, was the Swayambhunath stupa located on a hill overlooking the city. The Stupa, or dome shaped Buddhist/Hindu shrine, was also known as the monkey temple. This became apparent after we entered the temple complex and saw all the monkeys in the trees and wandering the grounds. After a history lesson and a brief explanation of the site we were given time to wander the temple. Hindu/Buddhist temples are rarely only one building and are more often a collection of small and large shrines. There was a pool not far from the temple where the monkeys gathered to swim and jump into the water. We probably could have spent all day there watching the monkeys enjoying the water. One funny little thing. Everywhere we stopped the driver and guide would jump out of the car to open the door for us. Being the down to earth middle class mid-westerners we are we would always open our own doors. It soon became a race to see who could open the doors quicker. This would become an ongoing game throughout Nepal, Bhutan, and India. 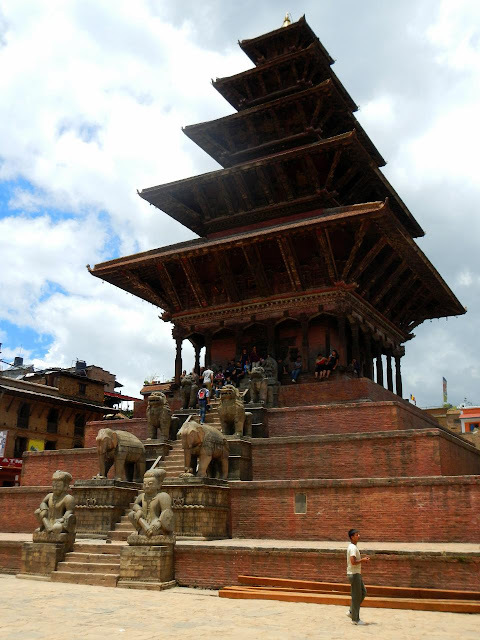 Next we went to the ancient royal quarter of the city to visit Durbar Square and the temples surrounding the area. We toured the area. There were several men dressing in orange and elaborately painted faces. I wondered if this was part of a religious ritual until I realized that they would let you take their picture for a price - it was just a tourist thing. I didn't take their picture. I did take a picture of our first wild cow wandering free in the square. Holy cow! Durbar Square in Kathmandu. The wife took some time to look at some scarves. When it came time to buy them I pulled out the credit card and ... their machine wouldn't work. We ended up leaving without buying. We ran into a few places with sketchy credit card machines. The Wife said this was a sign and, sure enough, it turned out for the better as we found cheaper, but just as nice, scarves later. The next stop was the city of Patan. 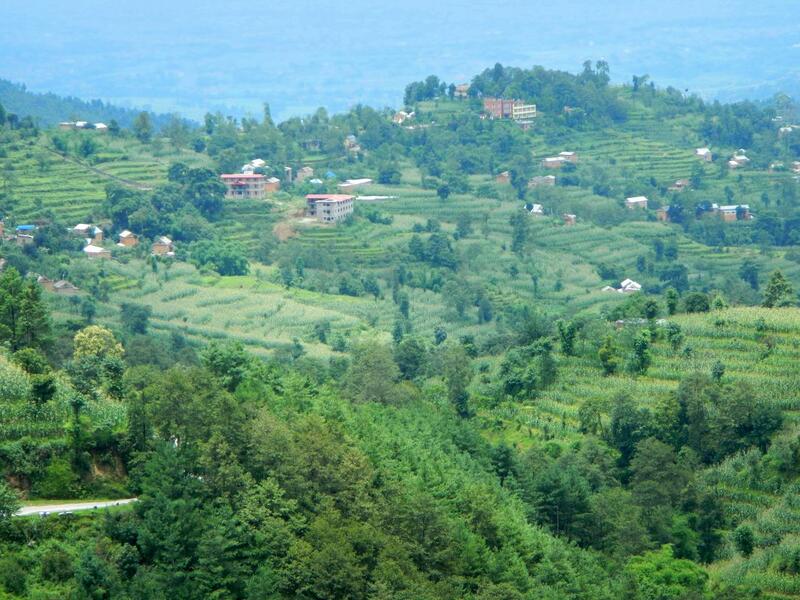 The itinerary describes this as a drive "into the lovely Nepalese countryside". On the short drive we saw absolutely no countryside. The itinerary description was obviously from an older time before Kathmandu and Patan had grown together, now separated only by a bridge over the Bagmati river. 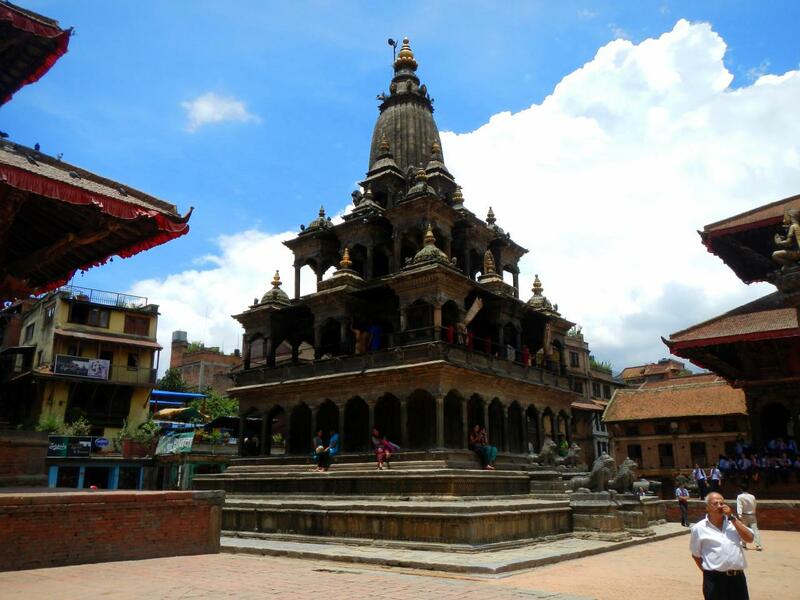 In Patan we visited an impressive temple complex with an ancient and still active aqueduct system. The Wife got her picture taken with some school girls having lunch there. After Patan we returned to the hotel. I was a little surprised by this. I'd expected a full day especially since the itinerary divided activities between morning and afternoon. We'd done the whole day by 2:00 PM. The days in Nepal were less packed than the China portion's had been. This felt weird to me and left me feeling a bit empty. We spent the rest of the day having our laundry done (Nepal was by far the cheapest place to do laundry - China, Bhutan, and India were much more expensive), receiving our Bhutanese visas, and napping in our room. We continued our western food trend when we both ordered hamburgers at the same cafe/restaurant we'd eaten the day before. The burger turned out to be a little too spicy for my tastes but the Wife like it. 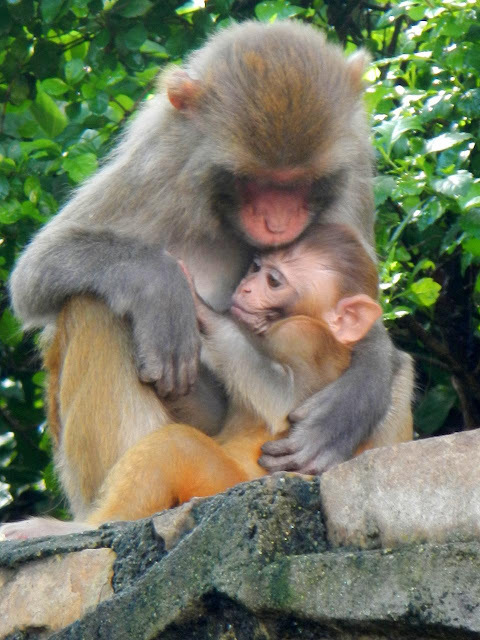 Pictures from days seventeen and eighteen (07/08 - 07/09/2012) can be found in my 2012-07 Nepal Google Photos album. China was magnificent. The tour had been structured perfectly. I mentioned before that the tour was done in reverse. This turned out to be perfect. I can't imagine starting the tour in Beijing all jet lagged, with a busy itinerary, and trying to get to know your new travel mates. Shanghai was a better place to get your bearings and for group introductions. We ended up with a group of wonderful people - not tourists but travelers. The group adds a lot. Of the three group trips I've been on (Peru, Jordan, and China) two of the groups have been an asset. Jordan is the only group that disappointed. Jordan was a mix of Americans, Central Americans, and Europeans. Peru and China were all American. That might have been the difference. Not to say Americans are better, we just had more in common. Our four day cruise on the Yangtze was a perfect length. We ran into another tour group who'd had a nine day cruise and they had been bored out of the skulls. Our cruise was full to the brim with activities with just the right amount of down time. We made it to Tibet, something the other tour groups we encountered could not say. Again I say, we were so ... so lucky to get to go to Lhasa. We went to the major Panda breeding facility in China. Other groups went to smaller ones in Chongqing. Add in all the temples, palaces, terracotta soldiers, Tienanmen Square, the Forbidden City, and the Great Wall and everything met or exceeded my expectations. All in all, we had an incredible trip through China with a very good guide. She suggested changes that all turned out for the better. She did not hesitate to answer our questions, even the tough ones about the cultural revolution and the one child policy. Her honesty was a pleasant surprise. While our guide answered all our history/political questions, she did have one short coming. There were four teachers in our group. Two were science teachers who loved to ask questions like "What kind of bird is that? What kind of tree is that? Where are all the birds?" Our guide couldn't answer any of them. It was like nature was a mystery to her. At one point a peacock screeched (if you've heard a peacock you know how they can be loud and obnoxious) and our guide said it was a panda. We all laughed at that. She eventually confessed to us that during those nature classes she had met her husband and was ... a little distracted. Not everything was great. I wasn't thrilled with the rickshaw ride in Beijing. We were there in monsoon season so the sun was a rare sight indeed but the lack of hard rain was welcome. Throughout our travels there was always an air of oppression. It wasn't unexpected, and it wasn't always obvious ... except in Lhasa where it felt like a cloud hanging over everything, but it was still there. In all of our hotels, very comfortable hotels, we always had access to CNN International, BBC International, and/or Al Jazeera. When we asked the guide about some riots in Hong Kong, she didn't know anything about it. Turns out these international channels are only available in hotels and are not available to the Chinese citizens. I didn't do much on the internet while I was there except check e-mail. The wife, being the obsessed teacher she sometimes is, had to check her students AP test scores. We never encountered a blocked site. When I got home I changed my e-mail password ... just in case. Most importantly the negative was overwhelmed by the awesome and I left China with wonderful memories and a bit tired from all of what we'd seen and experienced. I can't ask for anything more from my travels. Pictures from the China and Tibet portion of our travels can be found in my 2012-06 China and 2012-06 Tibet Google Photos albums. And then we scattered in the wind. Two of our group went on to Taiwan. Two more went to Hong Kong. Another went to Spain and Italy. Six others went home. The Wife and I, being only half done, had three more countries to visit. It would take us two days to get to our next destination, Kathmandu, Nepal. We were going to fly from Beijing to Chengdu, spend the night, then catch another flight to Kathmandu the next morning (flights eight and nine). We said our tear filled goodbyes at the airport as we went to check in to our respective flights. We reached the Air China counter and discovered that our flight would be delayed a couple hours (our first real delay). At the suggestion of the man behind the counter we rebooked on another flight getting us to Chengdu at our original scheduled time. We arrived in Chengdu and picked up our luggage and started looking for our guide. Here is an area that General Tours drops the ball a little bit - they don't provide contact information for the guides, figuring you will get their numbers when they pick you up. The guide and driver were not there. I knew what had happened. They had checked our original flight, saw that it was delayed, and and had not come to the airport. If we'd had their contact numbers we could have called from Beijing and told them how our plans had changed. We found some empty chairs near the airport exit and waited. I, being a little impatient, wandered around the area making sure we hadn't just missed our guide's sign and checking on the arrival time of our original flight. Two and a half hours later our guide arrived. She was very apologetic but it wasn't her fault at all. We spent the night at a hotel, not as nice as the one we stayed in during our first visit to Chengdu, but nice enough. I washed some clothes in the sink (shower gel works very well for cleaning clothes). We started a bad habit here and started watching bad movies in our room starting with "Christine". When there wasn't a movie we usually ended up on the Discover Channel or NatGeo Adventure (The programming on the international versions of these channels are more travel oriented and a bit more interesting than the domestic American versions which tend to be a lot of Nazis, Bigfoot, UFOs, and ghosts). I was feeling a little bummed. I think I missed our group. We were heading to another country and would be on a private tour. We'd never done private tours like this before and we really didn't know what to expect. Next morning we caught a flight To Kathmandu. Went to Indian Cave State Park last week and admired the colors of Autumn. I've tried, unsuccessfully to capture the colors ever since I returned to the midwest (see here, here, and here) but I was always a little too early or a little too late. This time I was just about right. 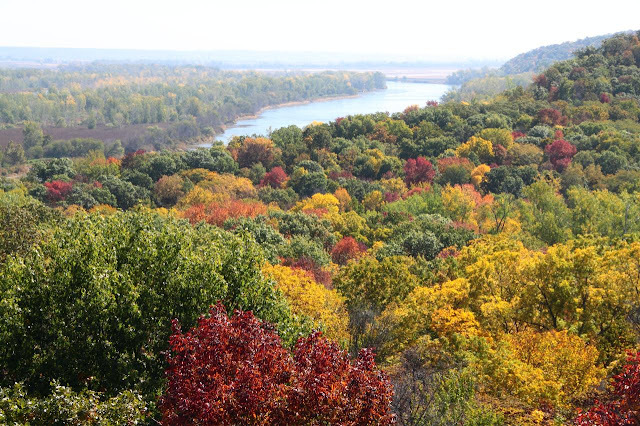 "Fall Colors and the Missouri River"
The last day of the China portion of our trip. It was going to start off with a big one - The Great Wall. A couple days earlier, during our Peking Duck dinner, our guide made a suggestion. Normally the tour would take you to Badaling. 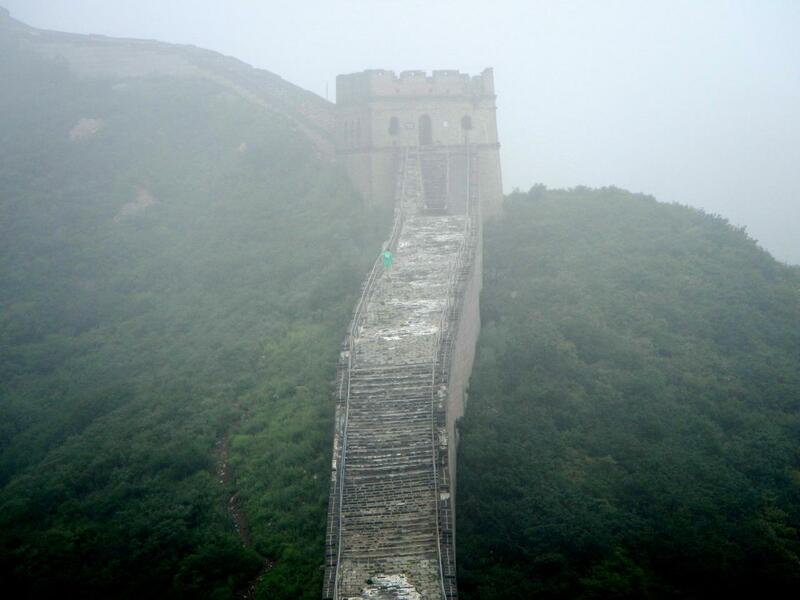 Badaling is the most visited portion of the wall and, if you've seen a picture of the wall, it was probably taken there. 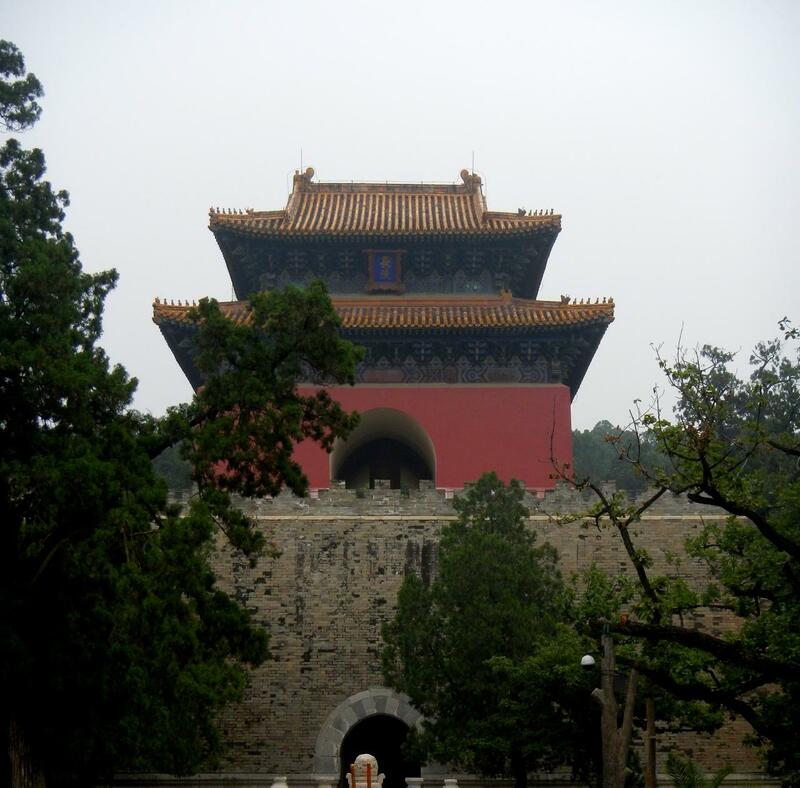 She suggested that we instead go to a place she called the Badaling Remnant (The ticket of the place referred to it as "The Ancient of the Badaling Great Wall."). Our first reaction was of uncertainty. When we showed pictures to our friends and family back home we wanted them to recognize it. We didn't just want to see a pile of old bricks. We decided to trust our guide when the Wife pointed out that Malinda had not steered us wrong yet. 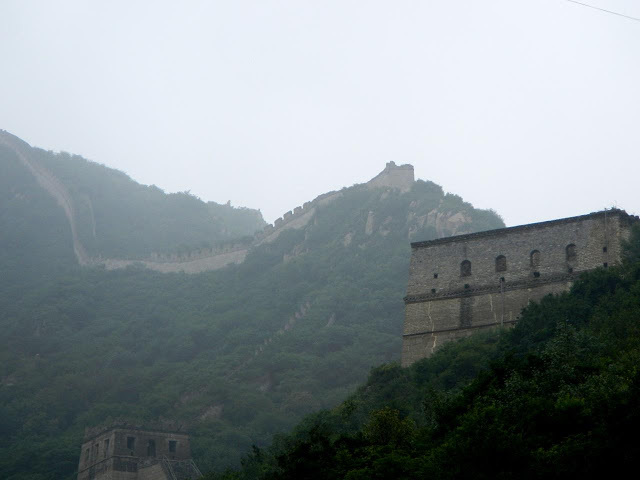 We left Beijing and along the way we passed Badaling. It was early morning and you could see that the wall was already packed with people and there were several buses parked in the parking lot. Like our guide had suggested, at Badaling all our pictures would be of backs, butts, and umbrellas. Less than ten minutes later our bus left the main highway and drove up a dirt road. The dirt road turned into a well maintained, and fairly new, paved road. We passed through a gate and passed a visitor's center that was still under construction. We left the bus, used the facilities (I saw this sign over one of the urinals), and went the rest of the way on foot. What we saw next was amazing. It was the Great Wall in all its glory. Not only that but we practically had it all to ourselves. There were maybe a dozen other people there besides us. This portion of the wall was restored by the Japanese and was definitely not a pile of rubble. This is interesting as the Chinese and Japanese notoriously do not get along (As I write this there is tension between the two countries over disputed islands). 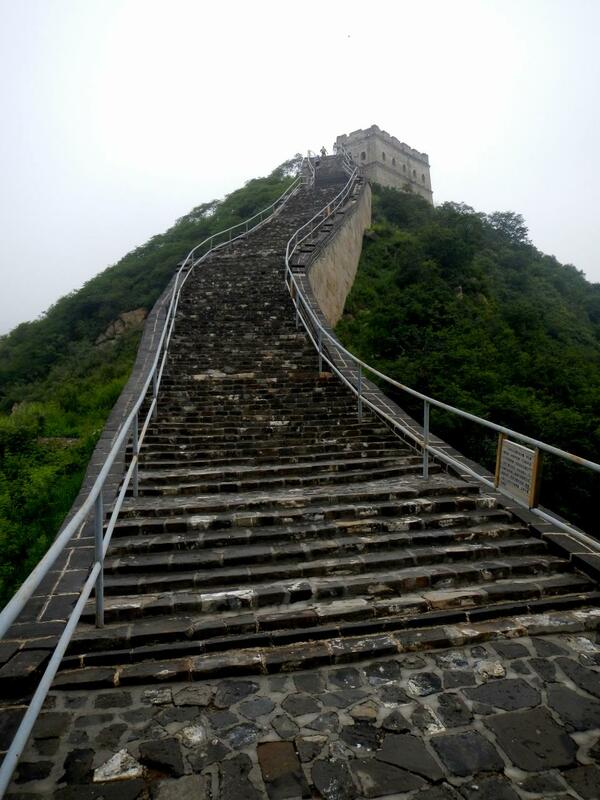 Lots of stairs on the Great Wall. The youngest of our group, with me following close behind, went on ahead of the group. It was insane and very cool. The wall is not flat but climbs up and down mountains. I couldn't keep up with KK and he ended up walking a longer section than I did (he was nearly thirty-one years my junior). It was cloudy this morning so a lot of my pictures came out sub-par but in person it lived up to what I'd expected to see. We all thanked our guide as we returned to the bus. The Wall all to ourselves - the youngest went the farthest. Next stop was a Jade factory where we saw them carving jade and were given a little tour before taking us into their large showroom - yep ... another shopping opportunity. Before we went shopping though we went to a restaurant attached to the factory and had lunch. After lunch we shopped a bit but the Wife and I ended up buying only magnets ... and ice cream. Next on our itinerary were the Ming Tombs. After the wall this felt like the power down phase of our China trip. We toured the tombs and the surrounding park and farm land then took a short bus ride to a long tree lined walkway. 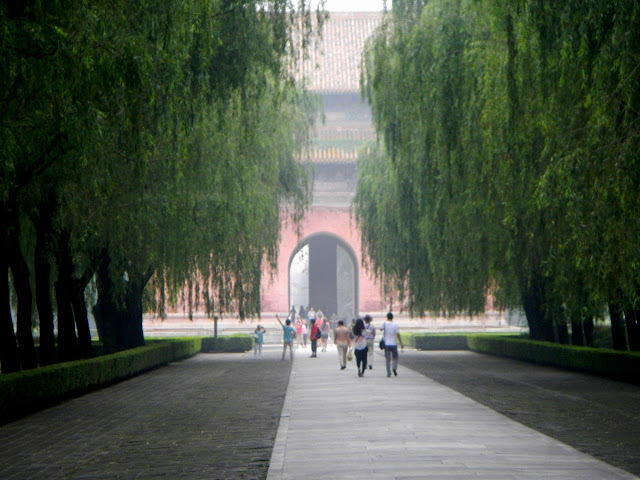 The walkway was lined with pairs of statues of men, animals, and mythical beasts. The most memorable happening here occurred in a bathroom. I walked in with a member of our group (JE) who was very tall (kept hitting his head on low doorways). Another Chinese tour guide was in there as well. The first urinal was a handicap/child urinal and was low to the ground. JE looked at the low urinal and said it wasn't for him. The Chinese guide than said "That one is for the Japanese. When they go to Europe they need a step stool." Heh. Long walkway at the Ming Tombs. By the time we were at the end of the long walkway it was starting to drizzle. We got back on the bus and headed back to Beijing with one last shopping stop. This was more at the request of our group. We wanted to stop at the knockoff market to buy some genuine fake stuff. The wife had her sights set on a bag. We found booth that sold what we wanted. The girls asked us to follow her and she proceeded to take us into the stairwell (The place was five stories if I recall). She produced a couple stools and a helper started bring up almost perfect copies of the bag the Wife was interested in. She even used the genuine bag catalog to pick out what she wanted. I have to admit that I was paranoid the entire time we were in that stairwell. I was just waiting for some big thug to come up those stairs and mug us. The Wife got her bag and we went back into the market proper and I was able to calm down a bit. That night we went out for our goodbye dinner at a Sichuan restaurant. Sichuan food tends to be a bit spicy hot. This meal was toned down a bit but there were a few dishes that set my mouth a flame. China was almost over. The group, whom had become very close, was on the verge of returning to their real lives ... except us. We still had two weeks to go. Pictures from day fourteen (07/06/2012) can be found in my 2012-06 China Google Photos album. Early voting started today and the Wife and I went out and voted. 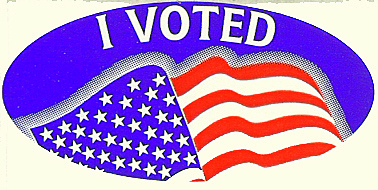 Now, will you please stop all the negative ads?